Dry and wet risers are designed for use by the Fire Brigade or other trained personnel and provide a readily available means of delivering considerable quantities of water to extinguish or to prevent the spread of fire in a building. A dry riser is a main vertical pipe intended to distribute water to multiple levels of a building or structure as an essential component of the fire suppression systems. 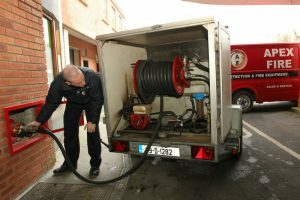 A Dry Riser comprises a fire brigade connection, which is an external access point at ground level through which water can be pumped from the fire engines pump to the firefighters’ fire hose attachments on each floor. Alternatively a dry rise fire sprinkler system is a network of pipes connected to fixed sprinklers inside a building, which are full of air until one of the sprinklers is triggered. Dry Risers must have fire engine access within 18 metres of the dry riser inlet box. Dry Risers in occupied buildings have to be within a fire resistant shaft. A Wet Riser is the opposite of a Dry Riser as it is maintained with the pipes kept full of water available either direct from a storage tank, via a booster pump, or fed directly from the towns main water supply. for manual or automatic fire fighting operations. 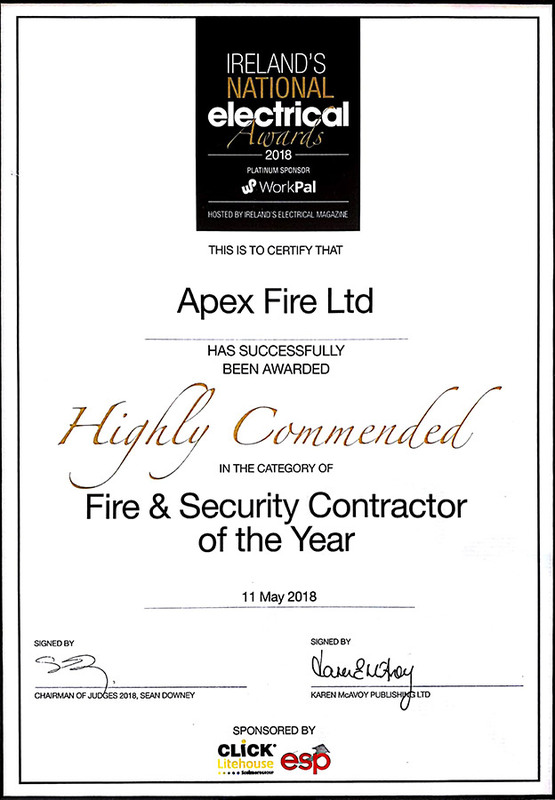 At Apex Fire our team of Dry and Wet Riser experts can design, install, test and maintain your Dry and Wet Riser Systems to ensure that in the unfortunate event that there is a fire on your premises, you have the peace of mind that the Fire Brigade or trained personnel will have ready access to the water supply needed to contain and extinguish the fire. In addition to design and installing Dry and Wet Riser Systems, our technicians carry out full maintenance to BS 9990:2006 by wet testing systems and ensuring both valves and pipe work are in adequate condition. Enclosures and ancillaries are also checked for purpose. Contact us or call our friendly team at 1850 929829 to get a quotation and see how our nationwide team can look after your Wet and Dry Riser needs.